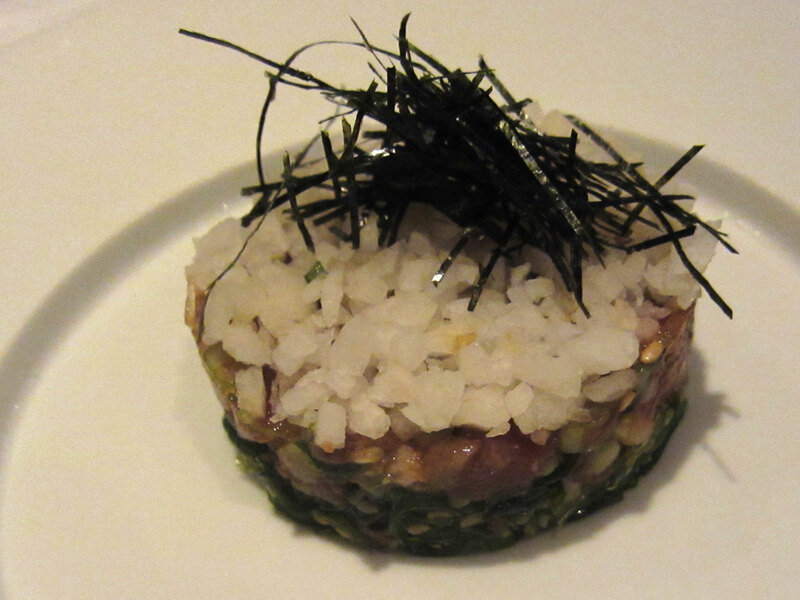 My first visit to Soto, a Japanese restaurant in Lower Manhattan, was actually in April 2012. It was so impressive that I went back with the “usual suspects” of food friends in October, the Saturday before that superstorm Sandy hit Manhattan. The restaurant was not easy to find, as there was no sign or name outside to indicate the location of the restaurant. So if you do ever visit this place, remember it’s number 357! The menu was extensive and served a whole range of dishes that sounded delicious enough without even sampling them! The four of us decided to pick with the dishes we really wanted to try, and then go for another round of ordering afterwards – if there were any dishes in the first round of ordering that were really exceptional, we could just ask for another portion in the second round. (1) Fluke Ponzu (Thinly sliced fluke with chive, shiso leaf, ginger shoots, scallion, under mizore ponzu sauce) was fresh and worked well with the citrousy ponzu sauce. 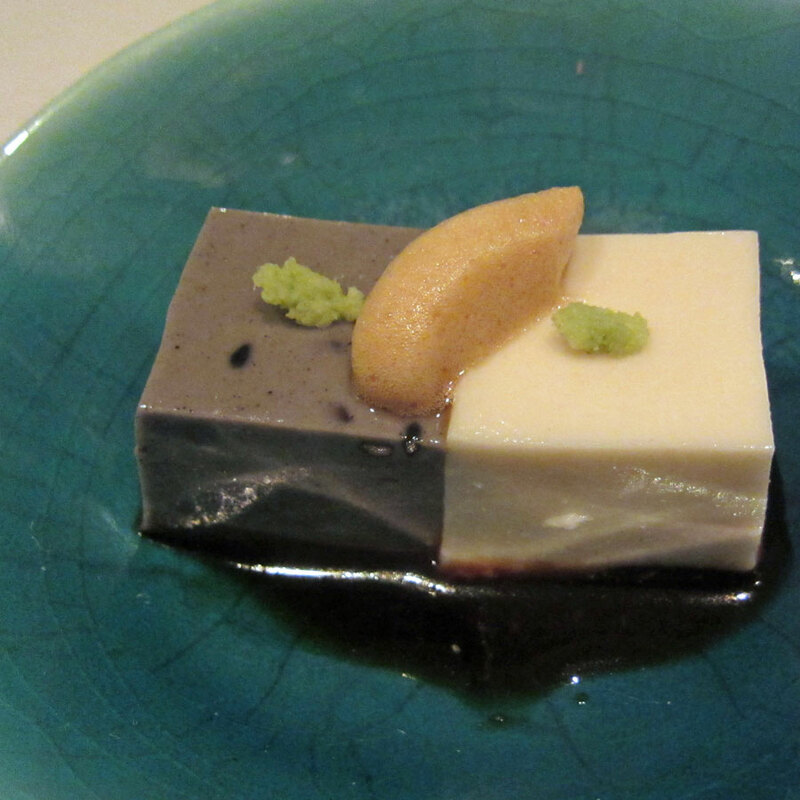 (2) Goma Tofu (Black sesame and white sesame tofu, served with wasabi soy sauce and soy form) had a silky smooth texture with a rather delicate soy sauce. (3) Uni Tempra with Uni Powder (Deep fried sashimi quality sea urchin in tempura batter, flavoured with home-made uni powder) was interesting with the sea urchin just melting in the mouth. 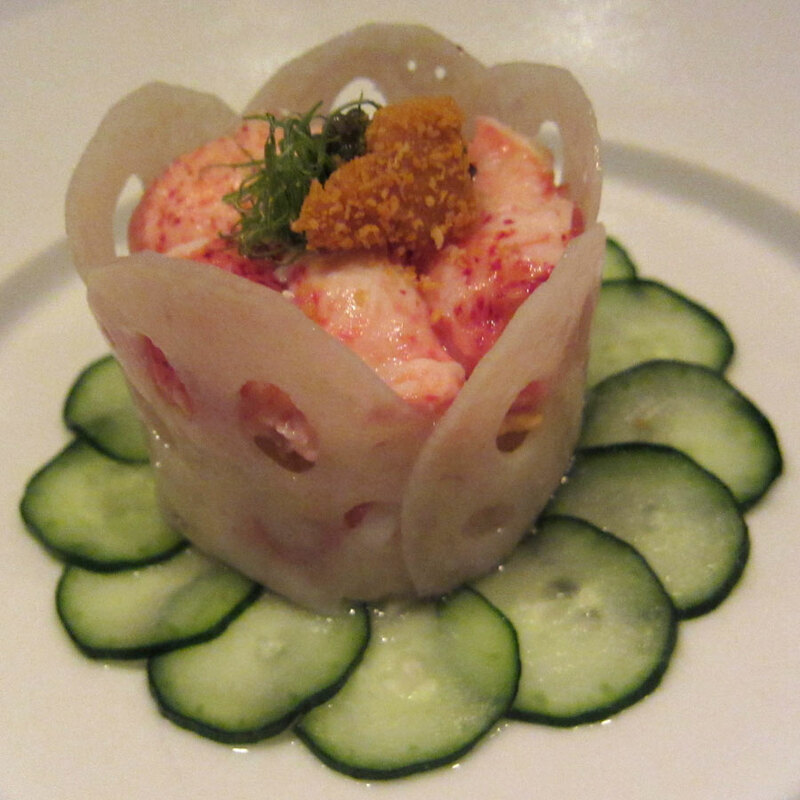 A first dish that won our hearts and got a repeat in round two of ordering. (4) Sea Trout Carpaccio (Cured sea trout with black truffle sea salt, chive and caviar, served with watercress with miso mustard sauce and sesame) was so fresh it was almost like eating by the sea. Another dish we simply had to repeat in the second round. 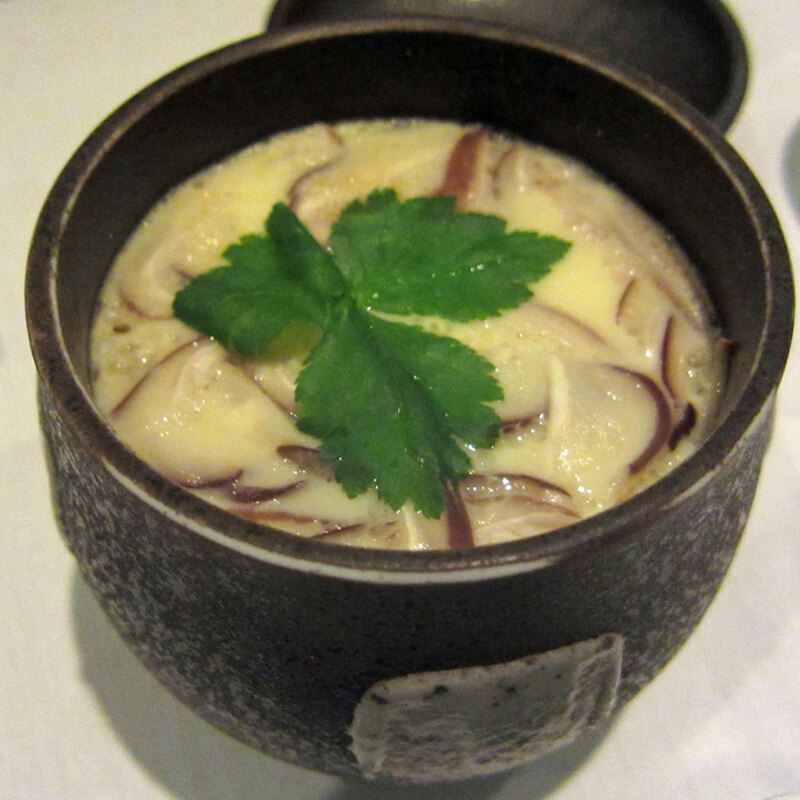 (5) Chawan Mushi (Traditional organic egg custard soup with shrimp, chicken, shiitake mushroom, mitsuba, gingko nuts and yuzu zest) tasted a little bland at the start but the flavour grew with every mouthful of it, and finished off to a very nice memorable taste. (6) Botan Ebi Tartare (Chopped botan ebi sweet shrimp with fresh ginger, topped with uni served with shiitake dashi broth) had the expected sweet taste of the shrimp. However there was too much of a ginger taste. 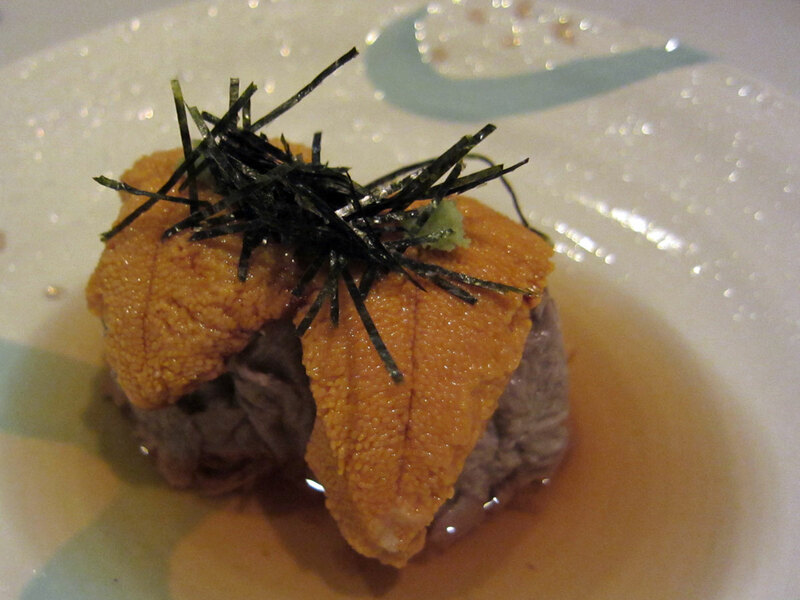 (7) Uni and Yuba (Black soy bean milk skin with finest uni, served with shiitake broth) was one of the very few disappointing dishes – a lack of flavour of any kind. (8) Tuna Tartare ( Chopped big eye tuna with pine nuts, asian pear, cucumber, scallion, sesame seed in spicy sesame sauce) was like a fish version of the Korean Yuk Hwe (raw beef), and it was delicious with a nice hint of spiciness. 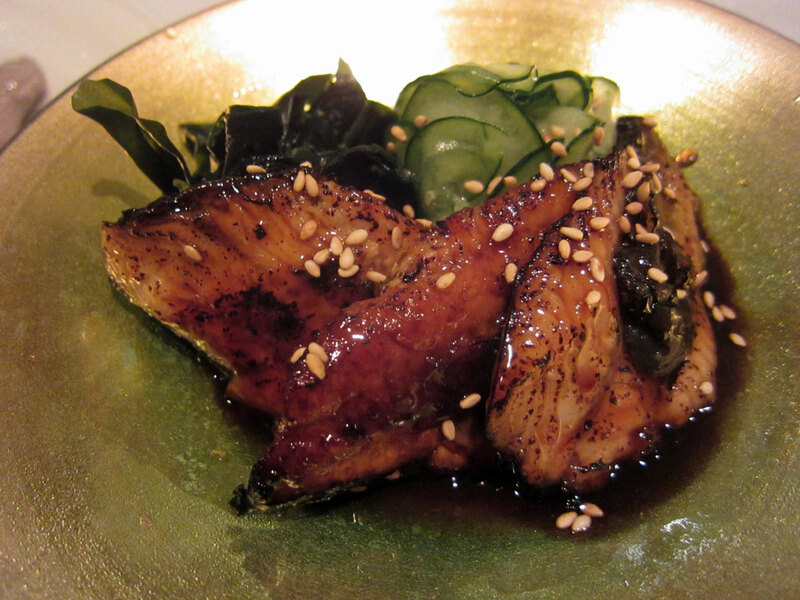 (9) Uzaku (Broiled fresh water eel with tosa vinegar and sweet eel sauce, garnished with japanese cucumber) was the third winning dish for us. 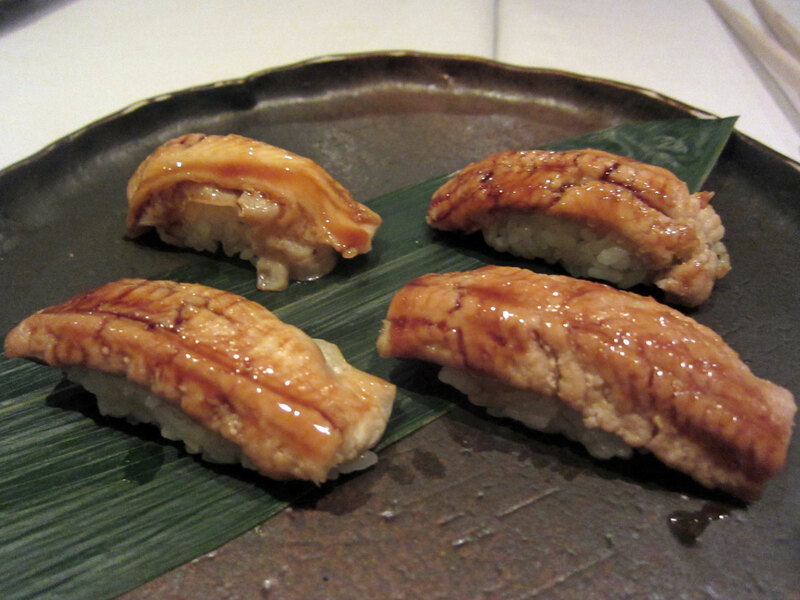 The sweetness of the sauce coupled with the delicious eel meant that we simply had to order another one to make sure it was that good – and it was! (10) Steamed Lobster with Uni Mousse (Layers of steamed Maine lobster and uni mousse in lotus wrap, garnished with smoked uni and caviar) was so beautifully presented that it left us staring at the dish for quite a while, wondering who would have the courage to ruin the piece of edible artwork in front of our eyes. However, the meat of the lobster was a little too cold (maybe we should have stared at the dish for longer to let the meat warm up a bit more) but the sweetness of the uni mousse really lifted the flavour of the dish. (11) Uni Ika Sugomori Zukuri (Sea urchin wrapped in thinly sliced squid with shiso, served with quail egg and tosa soy reduction) was interesting enough though it lacked the flavour somewhat, which surprised me because I was expecting the sweetness of the sea urchin and the soft-boiled quail egg would really come through in this dish. 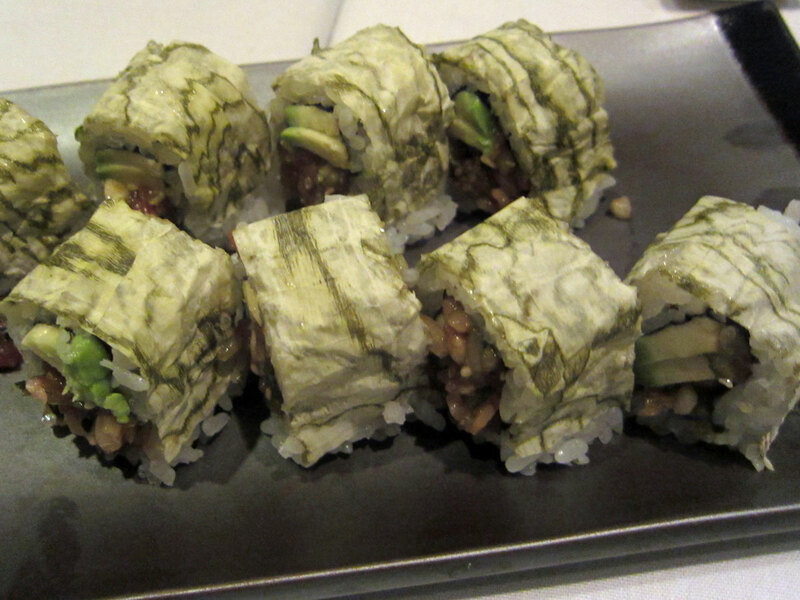 (12) Tartare Tuna Roll (Spicy tuna tartare with asian pear, cucumber, avocado, sesame, pine nuts, scallion wrapped in white kelp) had an extremely creamy texture and easily one of the best tuna rolls ever. 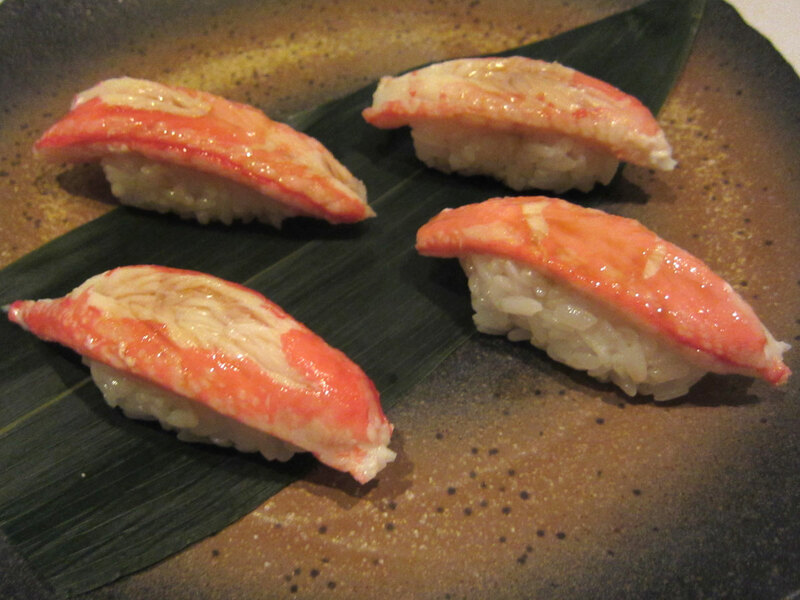 (13) We also had a few pieces of nigiri sushi: Maguro (blue fin tuna from Massachusetts) and Zuwaigani (snow crab from Nova Scotia) were good but not that impressive, while the Anago (sea eel from Nagasaki) had a very slick texture and was absolutely delicious. 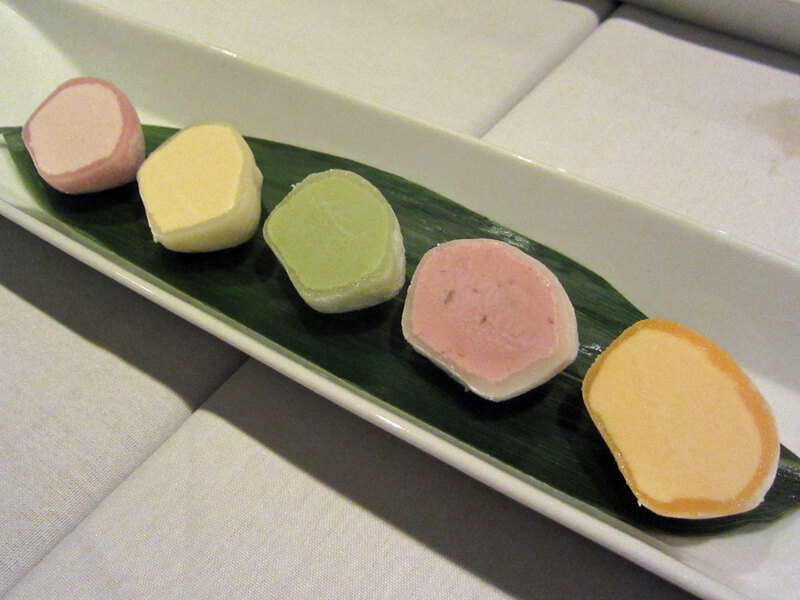 (14) To finish the meal off, it’s a selection of ice-cream mochi. Pleasant and light enough as a dessert. For a restaurant of this high calibre in the middle of Manhattan, the price was not ridiculously expensive. If anything, even with sake thrown into the meal, it cost no more than USD100 per person which was very reasonable indeed. I usually find Japanese restaurants that are Michelin-star-rated in the Western world rather disappointing, but Soto has proven that this is not always the case – if anything, it has become one of my favourite restaurants in New York City for sure. When hurricane Irene struck New York City during the last weekend in August 2011, New York went into an unprecedented shutdown. Not only did the public transport system closed down that weekend, most shops and restaurants decided to stay shut the whole weekend. I’d hate to think the amount of business lost during that weekend, especially when the weather improved dramatically by Sunday morning. Still, because of the transport limitations and I was staying near Columbus Circle, I decided to go somewhere not too far away for dinner. Fatty Crab on Upper West Side announced on Twitter that they were open on Sunday evening, so that seemed to be a good place to walk to for dinner. The restaurant was not a typical Malaysian restaurant – the decor and music was very much appealed to the younger trendy Western crowd. The food was “inspired” by Malaysian cuisine (as the restaurant said so on the website) and other neighbouring South-East Asian countries. Because of the hurricane, it was a reduced menu, but there were still plenty of choices on there. 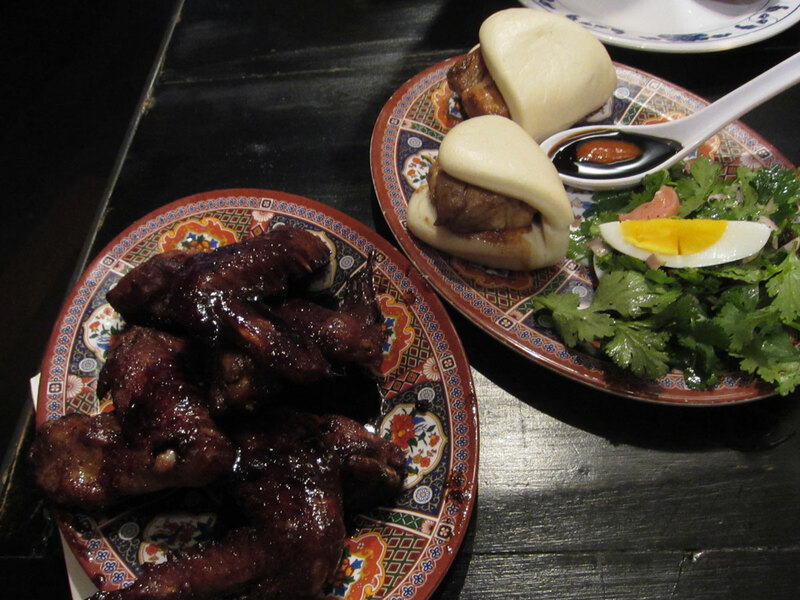 So to start, we opted for Jalan Alor chicken wings, and pork steamed buns. The belly of pork sandwiched in the steamed bun was divine – the flavoursome meat was served with a sweet soya and chilli sauce, with boiled eggs and coriander as garnish. The chicken wings were coated with a rich glaze of soya sauce – maybe a bit too much sauce but the dish did satisfy my craving for chicken wings that evening. 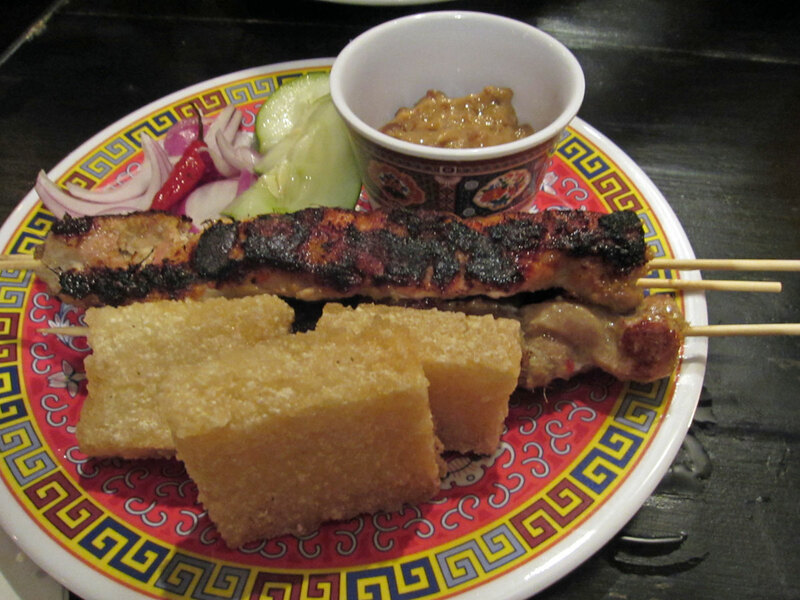 The next dish was Bobo chicken satay with lontong cakes, red onion, peanut sauce. The chicken unfortunately was somewhat too burnt on the outside and without any proper marinade, a bit bland and dry inside. For the main courses, we chose Fazio Farms Fatty Duck, with pickled mustard greens, gula jawa, thai chili; red curry okra and rice. Unfortunately the duck, which was deep-fried, was so tough and greasy that after two small bites I already felt that I’ve had enough. 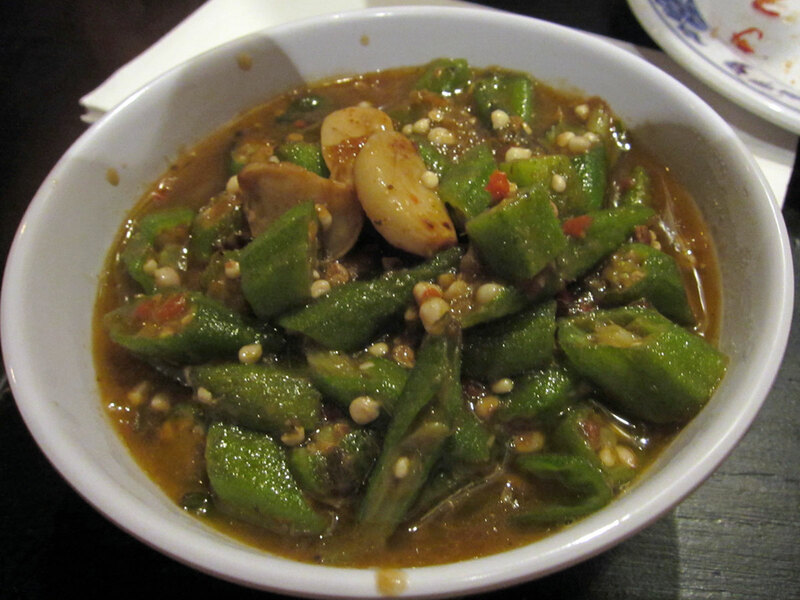 The okra was somewhat overcooked and just did not look very appealing to go into the mouth. The meal started on a high with the pork belly in steamed buns and then gradually went downhill from there. Service was warm and friendly without being pretentious – that’s a major plus. The place was vibrant and certainly would make a fun night out with friends, as long as quality of food was not high on your list. Luck must have been on my side with my visit to Momofuku Ko. This tiny 12-seater restaurant only opens the booking at exactly 10am Eastern Time in the US 1 week in advance for dinner and 2 weeks in advance for lunch on Fridays to Sundays, and the reservation can only be made on its website. On the Friday two weeks prior to my NYC visit, I kept reminding myself to log on to the site at 3pm in London to see if I could book for lunch, and if I failed to secure the booking, then at least I would have a few more days subsequently to try again. My brain inevitably drifted to think about other things – 3pm came and went without my realisation. At 3.15pm I suddenly realised what I should have done, so I logged on, and found that there was still availability on Friday lunchtime, so I made the online booking straight away. If I had gone for lunch or dinner on the following Saturday or Sunday, even if I could have secured the booking, I would not have been able to enjoy the meal there, as hurricane Irene hit New York that weekend, and the place was closed over the whole weekend. So I’d always remember this meal as the lunch before the hurricane weekend. I have heard a mixture of positive and not-so-positive comments from various people – I kept an open mind, with no expectation whatsoever even at a staggering price tag of USD175 for lunch. 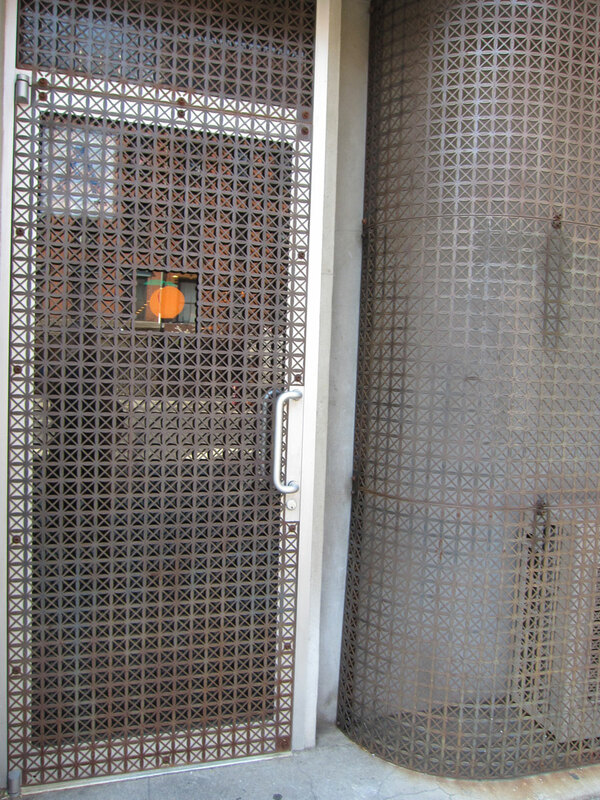 The restaurant entrance was probably one of the least attractive ones I have seen – with the metal grid, it looked like it’s closed down, and it’s easy to miss it unless you specifically looked out for the logo of the peach! We went in and showed the piece of paper with the reservation details, and were swiftly led to the seats at the counter (there’s no table as such) facing the open kitchen. There were already 4 diners there enjoying their lunches. 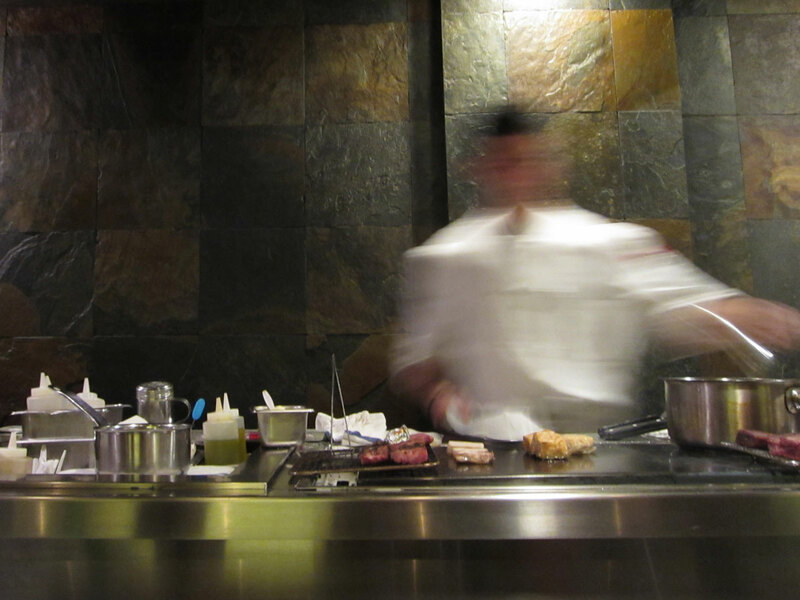 While it’s interesting to sit at the counter and be able to watch all the dishes being prepared and converse with the chefs, it was uncomfortably warm for me. (1) Palm souffle with dill mayonnaise and American caviar – These resembled mini spring rolls: crispy fried pastry filled with delicious smooth mayonnaise. The roll was light and airy. 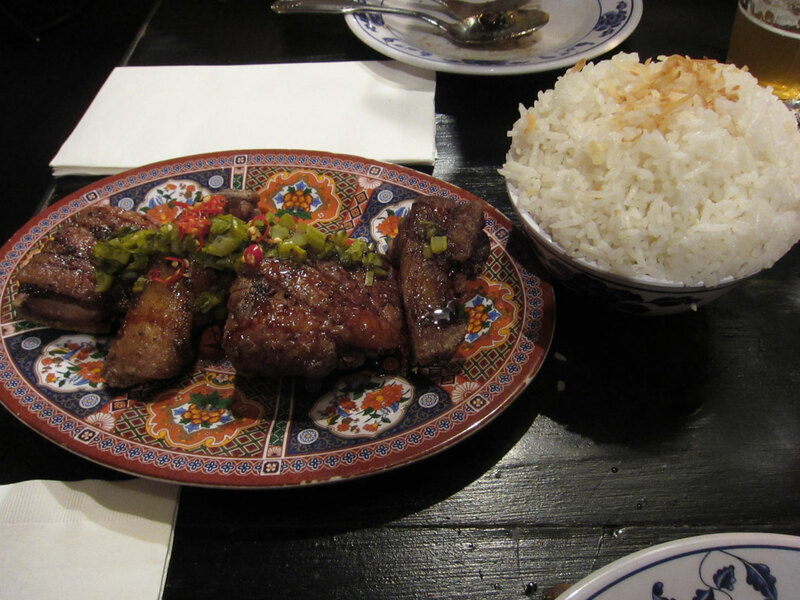 (2) Rib-eye beef with pickled okra, mint and dried jalapeno – A small but tender piece of beef served on a Chinese soup spoon, with the various flavours visiting the taste buds in turn: first the pickle, then the mint, and finally a sweet flavour from the sauce. 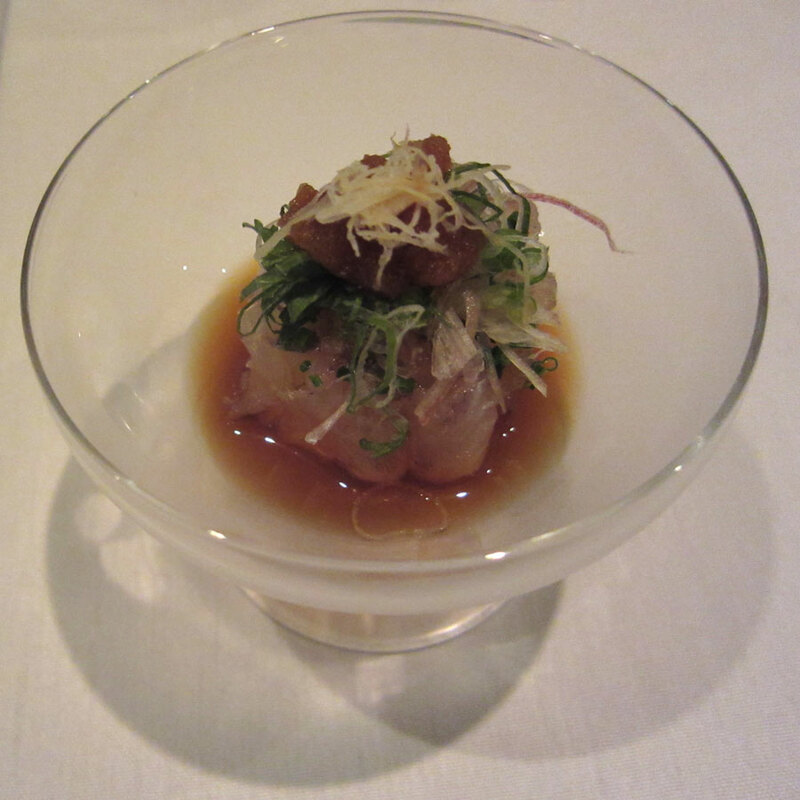 (3) Kushi oyster with sweet potato vinegar – This was OK but nothing distinctive to write home about I must admit. (4) Grilled octopus with avocado wasabi cream and dried olive – The strong kick of the wasabi failed to disguise the slightly fishy taste/smell of the octopus. Not really sure if the combination of ingredients worked that well. These first four appetisers were presented one after another in quick succession, to the point that I started to worry that either the meal would finish in an hour or we would have ended up with 30+ dishes at that speed of service. 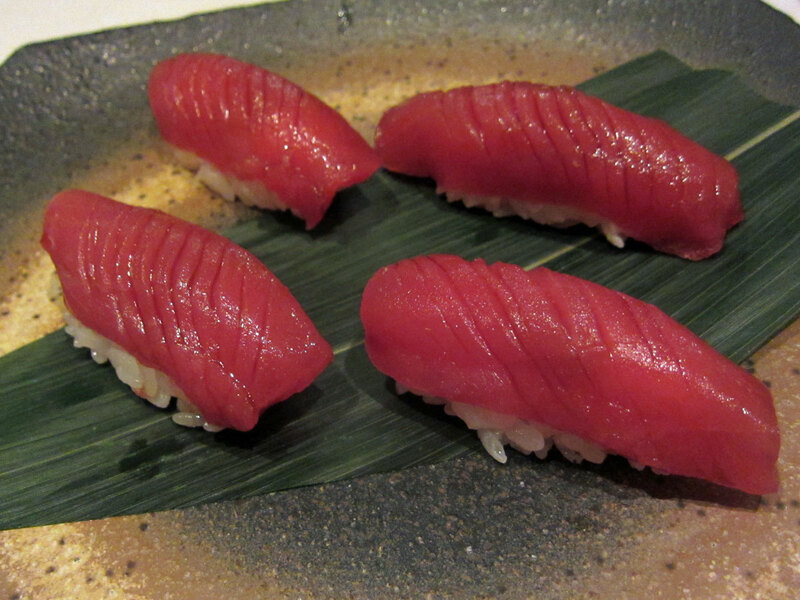 (5) 4 types of sashimi – Long Island fluke with black bean and daikon, Hamachi with water chestnuts and peppers, Bream with chopped chives and bonito flakes, Spanish mackeral with beetroot – the four different types of fish and preparations were presented as four little portions on a long plate. The one with the best flavour was the bream. (6) Mixed vegetable platter – Roasted carrot with rice cracker, summer salad of green beans with homemade XO sauce, Grilled Shishito pepper – The carrot was slightly too hard and would have given it a better contrast of texture with the rice cracker if it had been cooked a little bit more. The salad was refreshing with a good spicy kick of the XO sauce. The shishito pepper had a nice flavour without too much seasoning. (7) Mushroom salad with cilantro and jalapeno dressing – another dish with spicy taste to it, and while it was interesting to see a wide range of mushrooms gathering on the plate, the jalapeno left a rather strong spicy after-taste that it just lingered in the mouth for quite a while afterwards. Up to this point, I found that there was a higher-than-expected proportion of dishes with spicy taste and I must admit I got a bit fed up with that. While Russell was not keen on mushrooms, that mushroom salad was his favourite dish up to this point. But we both agreed that, after an hour of eating, we found that the dishes were nice but nothing that was truly outstanding. 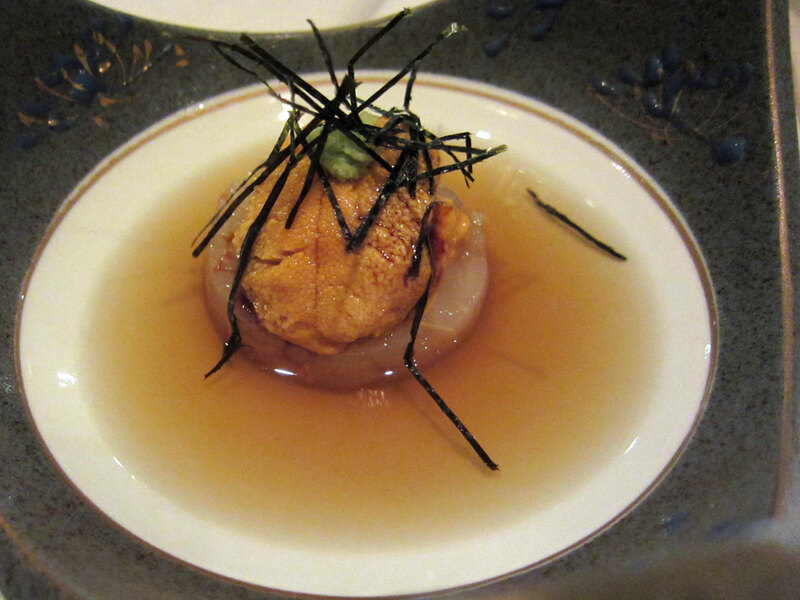 (8) Puffed egg with bacon dashi, sliced konbu and chives – Just as we thought the meal lacked the surprise, here we were presented with one of the most pleasant surprises of the whole meal. When we saw the earlier diners being served this gigantic “matzo”-ball look-a-like dish, we were wondering what it was. The size and the look of the ball put me off because it looked like a rather stomach-filling dish. Then we discovered that this was in fact beaten egg from the whipped cream charger, and then boiled for a minute or so, before serving on the soup dish, with a bacon broth. The egg-and-bacon flavour came through so well in the dish – it almost had the same magic as Fat Duck’s famous bacon and egg ice-cream. (9) Bento box: Halibut broth with spinach and beansprout, Grilled quail in barbeque sauce and squash slaw, Charred bak choi with black sesame, Grilled rice roll with pork fat and coarse sea salt. Instead of serving these in a proper bento box, they were served in individual dishes but arranged on the counter as if it’s a bento box. The broth had a spicy taste to it (yes, again, spicy!) but at least it had a clean and refreshing taste to it. The quail tasted like roast quail in a typical Chinese restaurant but nevertheless it had an excellent flavour and the meat was tender. The bak choi was non-descriptive and did not even look that appealing – OK, it may be supposed to look like pickled vegetable. The rice roll was delicious with the guilty pleasure of pork fat. (10) Ravioli stuffed with sour cheese, mushroom, chorizo, pickled tomato, sweetcorn and lime – Yet more spicyness introduced into another dish! The ravioli skin was rather thick, and the dish had a strong Mediterranean flavour that I thought for a moment that I was at a tapas bar! (11) Maine lobster with lobster mushroom, cauliflower mushroom, daikon, charred ground bean and saffron sauce – the lobster was cooked sous vide but it came out slightly too chewy which was a shame, as the dish had a very interesting mixture of flavour and texture that could have worked so well. (12) Rabbit pate, smoked cured lamb, smoked pig face, with pickled red onion and pickled cucumber mustard – a small platter of charcuterie, with spicy taste creeping in once again. (13) Deep fried short rib with 2 cubes of watermelon compressed with rose wine, fried eggplant with red miso, and eggplant puree – The beef was nice and tender, if somewhat too greasy because of the deep-fat frying. Luckily the watermelon cubes (looked like gigantic red dice) were refreshing and a welcoming addition to the dish to cut through some of that grease of the meat. By this point I was already so full that the sight of another large piece of beef (for the last 4 customers) being prepared in front of me made me feel a bit nauseous. 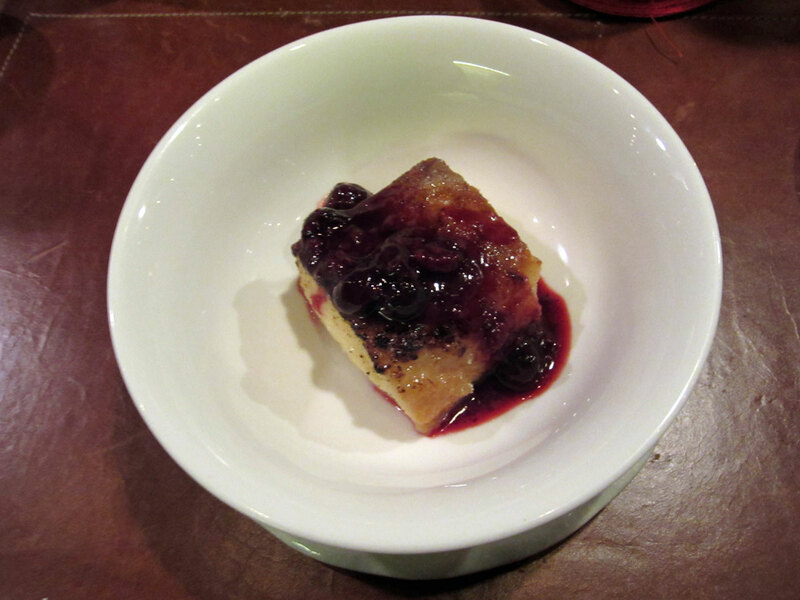 (14) Goat cheese sorbet, with little layered jelly cubes of pomegranate, earl grey tea, honey and milk – while I was not a fan of goat cheese at all, this dish was rather pleasant and I enjoyed it. Maybe it’s because the sorbet did not have a very overpowering taste of goat cheese, and the chewy jelly cubes with the intense flavours really made the dish stand out. (15) Shaved Hudson Valley foie gras with lychee and pine nut brittle, riesling wine jelly – it’s one of the signature dishes of this restaurant. I was not convinced that it worked – while I liked all the ingredients individually, together I didn’t think it was a happy combination. The strong flavour of the wine was competing with the other flavours also. (16) Pineapple sorbet, with frozen pineapple slice, dried pineapple, and house-brewed root beer – this was refreshing, with the various textures of pineapple in this dish. 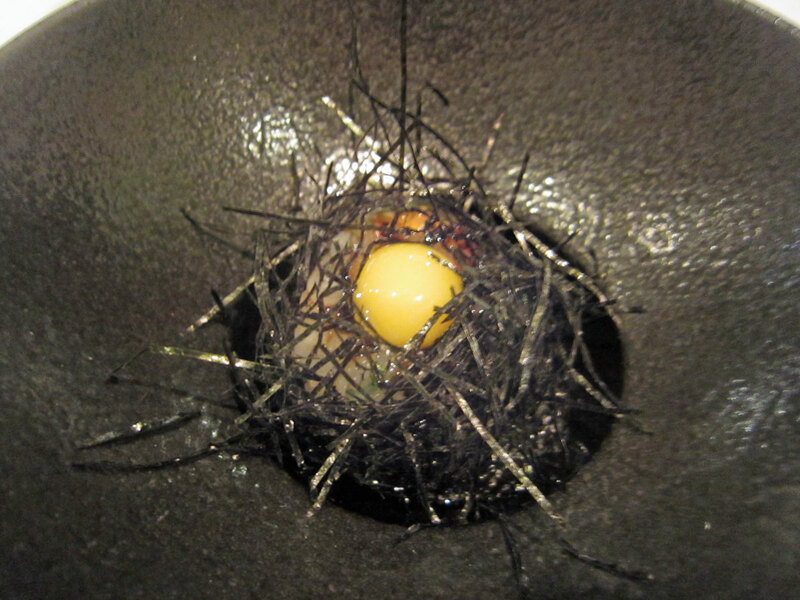 (17) Toasted rice cone with miso ice-cream, sticky rice and mochi – It was light and a nice way to finish the meal. (18) Onigiri with kim chi – this was given to us to take home, but unfortunately I only rediscovered the onigiri about 3 days after the meal, so I did not dare to eat it. On the whole, the meal was an interesting journey of flavours and combination of ingredients, and it’s a roller-coaster ride of impressive dishes to the “nothing-to-write-home-about” dishes. I was glad to have visited the place nevertheless. The final bill, including a small bottle of sake and tips, came to a whopping USD500 for two – I am still pondering whether it’s worth this much. While the chefs were friendly enough and did take some opportunity to chat to us briefly when they are not busy preparing the dishes, the service from the restaurant manager was colder than liquid nitrogen. While I don’t expect the staff to be ultra-friendly, but a little smile wouldn’t hurt. The thing that left a bad final impression was that when we were leaving, she just initiated a social conversation with her colleague about 3 feet away and did not even acknowledge our departure, let alone saying farewell – not something I’d expect from a Michelin-starred restaurant. Rude? One of my ex-colleagues in Boston shares the same surname as me (and no, we are not related) and she loves her food, so there was a running joke in the company that we were the London and Boston representatives of Chow With Chau guide on the company intranet. She is now living in Manhattan. So when I was out there visiting, I thought I’d meet up with her for dinner, and let her decide on the restaurant. After consulting some of her friends, she informed me that she’d made a reservation at Degustation in East Village, based on the recommendation from a friend of hers that “it was the best meal I’ve had in NYC”. The restaurant was smaller than I expected, and it’s basically an open kitchen with customers sitting at the bar (though we were sitting on chairs and not bar stools). Having experienced the rather “warmer-than-average” open kitchen setting at Momofuku, this one was a lot more pleasant. As our reservation was rather early in the evening, the restaurant only had a small handful of people in there, though we were still “asked” to wait at the tiny reception area for a minute, for no apparent reason, before we were led to the table. The menu contains a selection of small dishes, a bit like having tapas really. We were told that we could either order a la carte (in which case, we’d order about 3-4 dishes per person) or go for the 5-course or 10-course tasting menu. We decided to go for the 5-course menu, as I was still quite full after a heavy lunch earlier in the day. 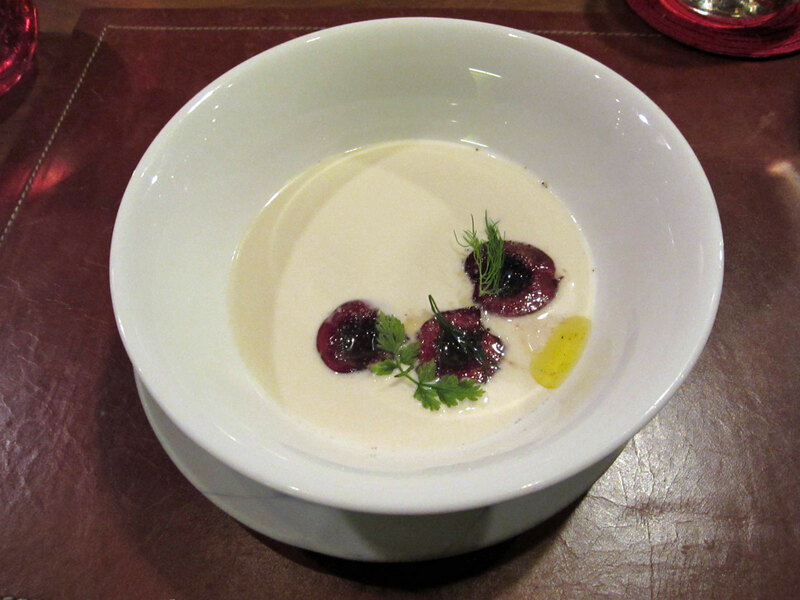 The first course was Ajo Blanco with cherries and fine herbs: the white garlic gazpacho was creamy and a welcoming soup for a humid summer evening (it was the evening before New York City went for a complete shutdown due to hurricane Irene – so the outside was rather stuffy). The cherries gave a bit of extra sweetness to the taste of the soup. 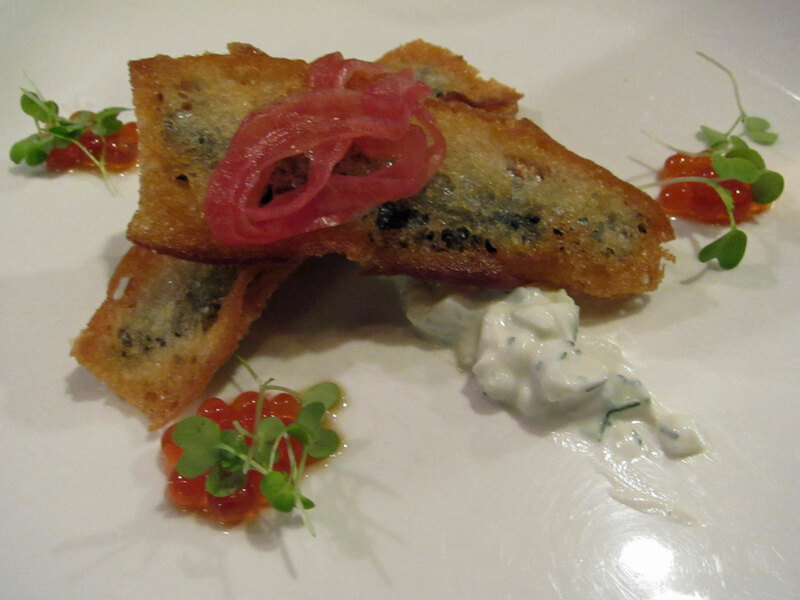 The next course was marinated sardines wrapped in nori and served with salmon roe – the thin slices of sardines were sandwiched between the seaweed and then deep-fried to a very beautiful crispy and light texture. This was probably the best dish in the whole meal. 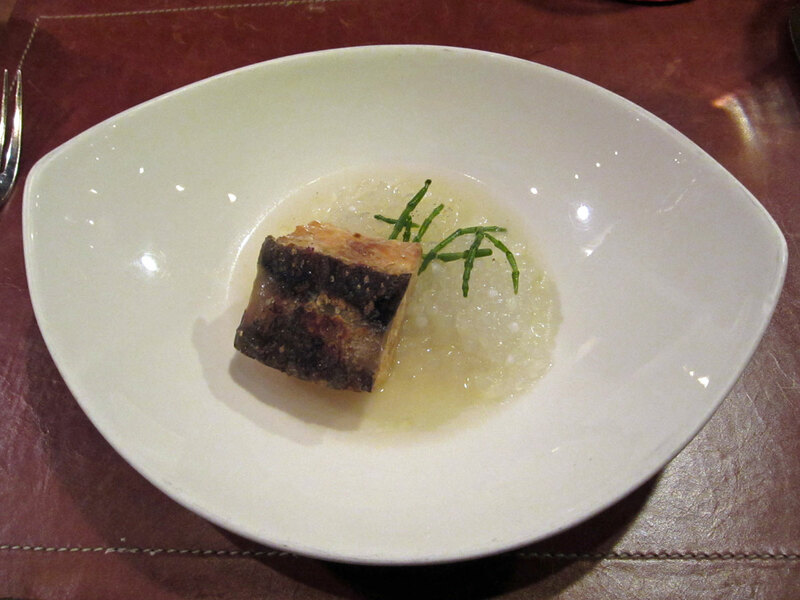 The third course was sturgeon with vegetable caviar and sea beans – the vegetable caviar was essentially tapioca, which was nicely cooked. However the sturgeon was verging on the tough and dry side. While the taste was nice, the texture and presentation was a let-down. 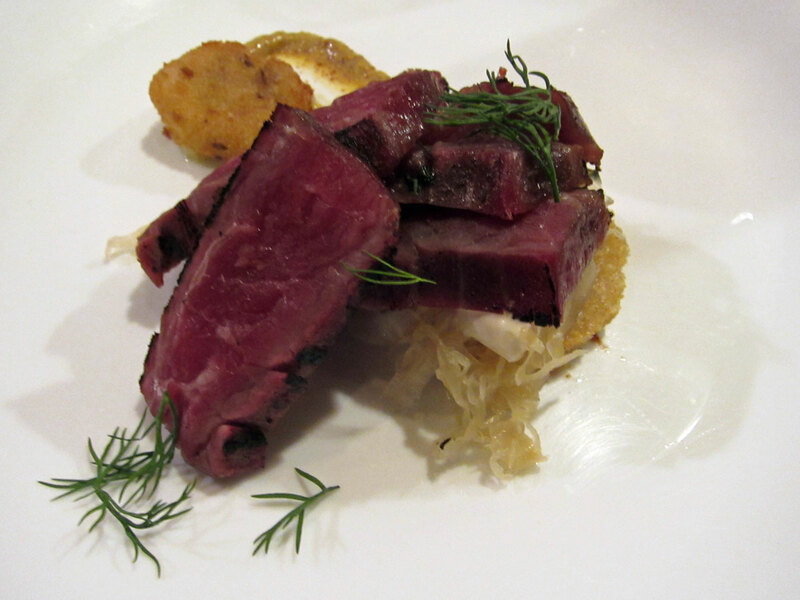 The fourth and last savoury course was flank steak on rye, sauerkraut and served with a spicy mustard – I was not keen on this dish at all. The flank steak was cooked to a pastrami style: unfortunately it was rather tough and even with a good steak knife it was still a bit of an effort to cut through the meat. The spicy mustard had a very strong bold flavour – maybe a little too strong if more than just a little dab of it was used with the meat. There were two choices for the dessert: Caramelised Torija or a chocolate pudding with vanilla marshmallow and granary cracker. I was going to opt for the chocolate, but then they could not tell me what chocolate they used, so I thought to be on the safe side, I’d go for the former. It turned out to be a good choice – the torija was like a brioche-based bread and butter pudding, with a nice thin crust of caramelised sugar on top. By the time we finished the meal, the restaurant was completely full and there were already customers on the second seating. It’s a nice cosy restaurant and a fun place to take a friend or two to for dinner. However, due to the layout, it’s probably not a good idea to go with more than 4 people as you can’t really have a conversation with everyone without shouting across. The waitress was friendly and very helpful in explaining some of the dishes. If I didn’t have such a big lunch a few hours before, I’d probably have happily gone for the 10-course tasting menu. Ah well, there’s always next time!